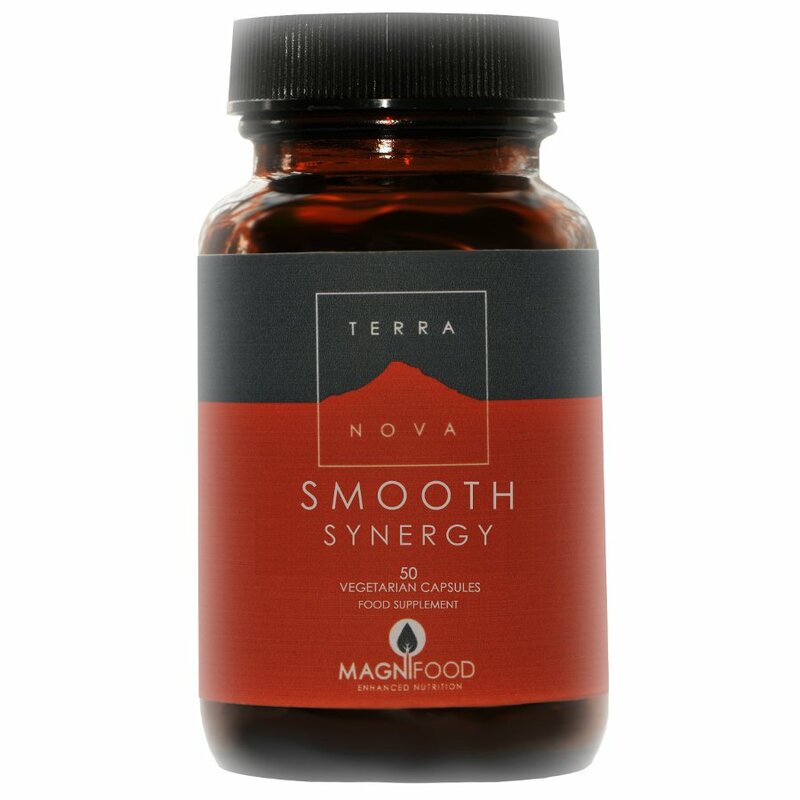 Terranova's Smooth Synergy is a vegan food supplement for adults and is made without the use of fillers, binders and other excipients. The following ingredients are included giving a range of beneficial effects: Ashwagandha Root - may support energy metabolism and nervous system health. Avena Sativa (Green Oat Seed) - The milk stage of oat seeds provides one of the most soothing and gentle, tonics for supporting healthy nerves. American Ginseng - may help support healthy adrenal function and energy metabolism. Rhodiola Root - may support energy metabolism, healthy neurotransmitter balance, mental performance and nervous system health. Stabilised Rice Bran (SRB) - has one of nature's highest concentrations of nutrients involved in energy metabolism and nerve health such as B-vitamins, alpha lipoic acid and co-enzyme Q10 (CoQ10). Ginger Rhizome/Root - maintain healthy circulation. Cayenne Fruit Ð Often used as a tonic to help maintain healthy circulation. It is also commonly used to help facilitate distribution of nutrients in the body. Two capsules provide: Ashwagandha Root 200mg, Avena Sativa [Green Oat Seed] (fresh freeze dried, organic) 200mg, American Ginseng (fresh freeze dried) 100mg, Rhodiola Root Extract (fresh freeze dried) 100mg, Stabilised Rice Bran 100mg, Ginger Rhizome/Root (fresh freeze dried - organic) 25mg, Cayenne Pepper (fresh freeze dried - organic) 5mg, Vegetable Capsule Shell 236mg, Inositol 100mg, Magnesium (as oxide, citrate) 100mg, Pyridoxal 5-Phosphate (P 5-P) 2mg, Vitamin B12 (as methylcobalamin) 500ug. Adults should take 1 or 2 capsules daily with food. Do not exceed stated dose unless directed by a healthcare practitioner. Smooth Synergy is free from wheat, gluten, preservatives, flavours, colours, sugar, additives, animal products, dairy soy and corn. Ashwagandha Root 200mg,Green Oat Seed [Avena sativa] (fresh freeze dried – ORGANIC) 200mg,American Ginseng (fresh freeze dried) 100mg,Rhodiola Root Extract (fresh freeze dried) 100mg,Stabilized Rice Bran 100mg, Ginger Rhizome/Root (fresh freeze dried – ORGANIC) 25mg, Cayenne Pepper (fresh freeze dried – ORGANIC) 5mg, Inositol 100mg, Magnesium (as oxide, citrate) 100mg, Pyridoxal 5-Phosphate (P 5-P) 2mg, Vitamin B12 (as methylcobalamin) 500ug, NO FILLERS, BINDERS OR OTHER EXCIPIENTS SUITABLE FOR VEGETARIANS & VEGANS NO WHEAT – NO SOY – NO YEAST – NO DAIRY – NO GELATINE – NO ANIMAL INGREDIENTS – NO ADDITIVES – NO ADDED SUGAR – NO COLOURS – NO FLAVOURS – NO PRESERVATIVES. Contains Oat seed – consult physician if coeliac. The Terranova Vegan Smooth Synergy Supplement - 50 Capsules product ethics are indicated below. To learn more about these product ethics and to see related products, follow the links below. 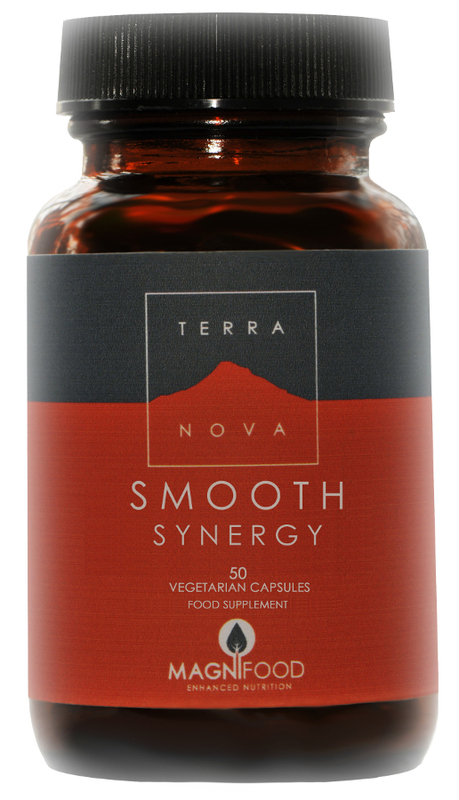 There are currently no questions to display about Terranova Vegan Smooth Synergy Supplement - 50 Capsules.